Really pleased to announce our latest partnership. Those nice people at Kodak have given us their brand new portable VR camera to shoot a series of eight short films in and around London before Xmas (gosh we’re going to be busy). Called the Kodak PixPro 4K VR360, it’s a compact little camera with twin domes (one either side) of the white housing, each with a fixed focus 20 megapixel lens. You can see a picture of it sitting on a small tripod above. And while VR is great (just check out https://www.youtube.com/vr using a VR headset or Google Cardboard), that’s not all this clever little box of tricks offers. Using the PixPro app on your iPhone or your Android smartphone, you can choose from a wide range of filming angles from 91 degrees right through to 360 degrees. This includes a 197 degrees wide angle lens and a hemisphere view with a 235 degrees super wide-angle lens. Also on board are various filming options, including the ability to shoot time lapse footage (we’ve featured some in our video below). Over the course of the next four weeks, we’re going to be filming in and around London with this £399 camera. You can check our first taster video below which gives you just a glimpse of what the Kodak PixPro offers (we think it’s pretty good for the price). Also don’t forget to watch out for our future videos, many of which will filmed in total VR so you will have to wear a headset to get the full experience! 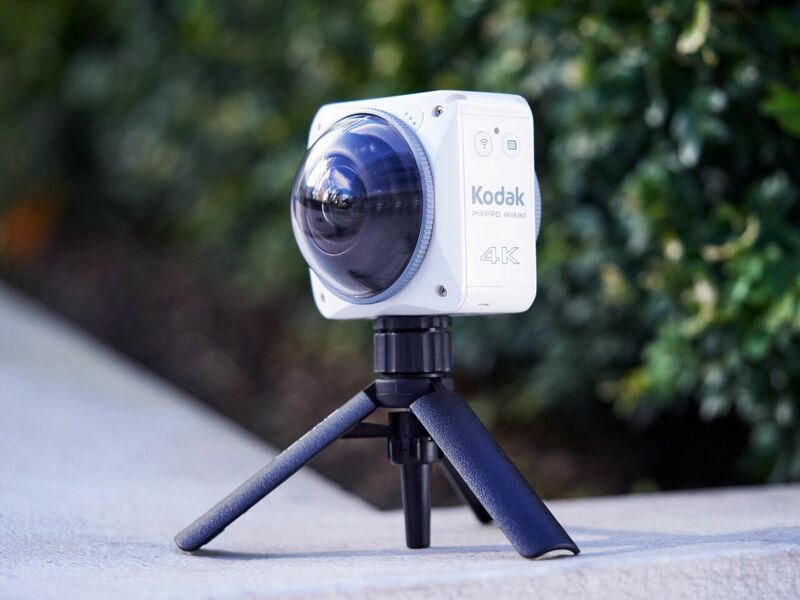 For more information about the Kodak PixPro 4K VR360 see here.